You may have heard the Bacon, Lettuce, and Tomato sandwich called the best sandwich. A mix of salty, crispy, and fresh. We had so much fun putting bacon on a boat in April, let's do it again. On August 26th, we'll be setting sail around Boston Harbor for a Sunday Funday with BLTs, beer, and karaoke. 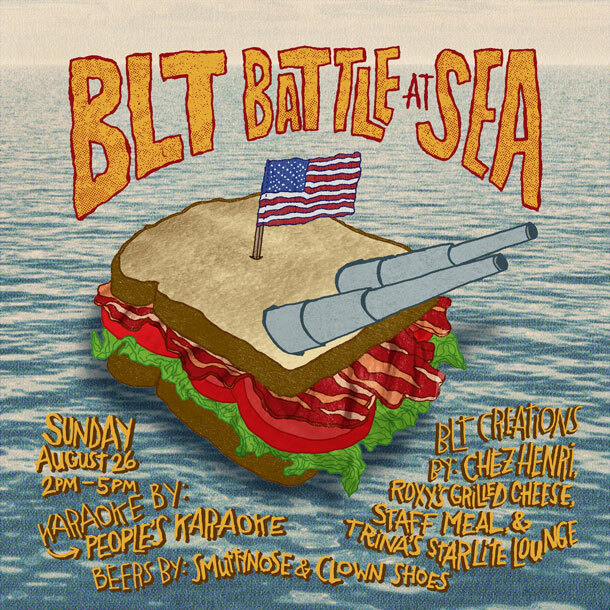 The BLT Battle at Sea is a showcase of BLT-related treats from Trina's Starlite Lounge, Chez Henri, Roxy's Grilled Cheese, and Staff Meal. The Smuttynose Brewing Company and Clown Shoes Beer will be there, too, providing tasty refreshments. And there will be karaoke from The People's Karaoke, so get your pipes ready. The karaoke was amazing last time, a high bar has been set. Each ticket entitles the purchaser to bites from each of the participants along with beers from Smuttynose and Clown Shoes. Smuttynose and Clown Shoes will be available for purchase for the entire cruise. Boarding begins at 1:30 at Gate C behind the Boston Harbor Hotel. What song are you going to sing? This is a 21+ rain or shine event. UPDATE 8/13: St Germain is teaming up with Smuttynose to make a Star Island Shandy beer cocktail. Good times! This ticket is good for one entry to the BLT Battle at Sea Harbor Cruise. Boarding is at Gate C behind Boston Harbor Hotel.